“Range after range of mountains. Spring break this year, we drove across the West and past many, many mountain ranges in Idaho, Nevada, Utah, Arizona, and Montana. I didn’t dare sleep in the car or stare at my phone while being a passenger moving past them because I’d miss them. Instead, I gazed across the landscapes or would read my tattered paper road maps splayed across my lap and try to find out the elevation of the highest peak that I could see in the distance or the next little town coming up. On one particular mountain in Nevada, I tried to imagine the route I’d take to the top. Looking out the back window as we drove past it, Bob asked what I was doing and I told him I was trying to figure out a good route to the top. He asked if I was planning on doing that anytime soon. I told him no, but anything is possible. The western United States is blessed with vast areas of public lands in the middle of nowhere that rarely get stepped on by a human foot, but it doesn’t make them any less special or less valuable. If anything, it’s the opposite. It wasn’t until spending time the past few years hiking around the chukar hills that I realized how important they were to me. On our road trip across the West, I started reflecting back on all the many hundreds of miles hiking up and down these mountains and back to the beginning. I felt like talking about it in the video (below). Great post! My feelings exactly. I also like to imagine what the families were like when I see old abandoned farm houses and barns. I also used to like to catch up on my reading when riding on trips. Now, I don’t want to miss anything! Leslie, thanks again for another post that pushes up my pulse. It would be rare for me if 24 hours passed without some thoughts on where you live, the birds and dogs. Your videos and photos help with the mental image. Hopefully both you and Bob will extend the legacy of your friend Sam by enjoying the Idaho hills, chukars and the dogs into your 80’s. Hells Canyon and the rim country is definitely special. I think about it all the time, especially since I can see some of it out of my living room window, every day. We hope you are planning a trip here again in the fall. Bob and I plan to hunt until we’re 80, but unfortunately a lot of the chukar habitat is being overrun by Medusahead. 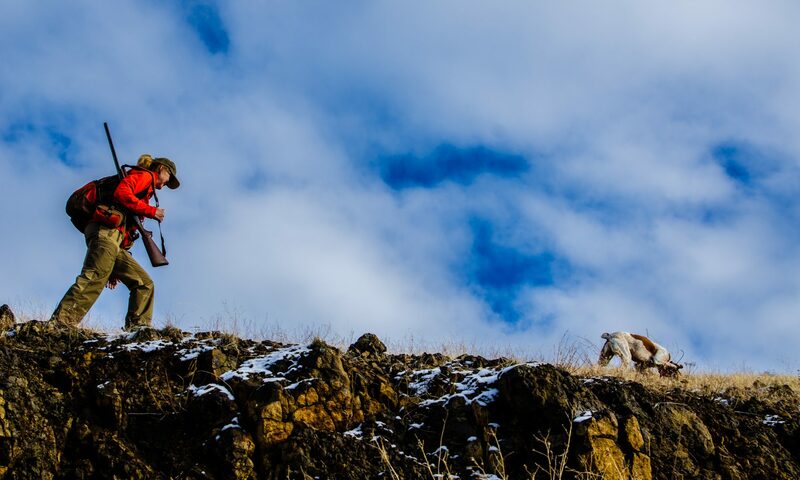 I’m not sure what the future of chukar hunting down there will be like, but I’ll take full advantage of it this coming season. Beautiful video! I’ve been following your adventures for 7-8(?) years now. Leslie, your photos, and now your writing, have been like a wonderful present found in my inbox. I hope Bob is feeling much better following his surgery and you’re both able to follow those wonderful dogs all season in the coming Fall. Bob is feeling great, thanks for asking. I fear that I won’t be able to keep up with him being 100% this coming fall. Leslie, this is a beautiful story. May I share a link on the Pheasants Forever Yolo County Facebook page, which will push it to our web page too) as well as my own? Mark, thank you so much for the comment. Another winner Leslie. I’m in UT on the way home. See ya’ll soon. Thank you Sam. It’s gorgeous here at home…something for you to look forward to. Drive safe. Well done and happy you’ve chosen to complete the cycle of harvester/handler. Getting to watch a pointing breed paint a beautiful picture in the terrain we hang out in is well……mind consuming. Keep up the great videos. Bill, I appreciate you taking the time to comment.